..:: When A/R Is No Longer Considered An Asset & Filing A Lien Is. :: Zlien ::.. When A/R Is No Longer Considered An Asset & Filing A Lien Is. Everyone knows Accounts Receivables are supposed to be considered assets but are they always? Company A sells a large item or provides services to Company B. This item/service that Company B purchased is something that adds value to the existing property or business or maybe it was for resale. That is a factor we will determine later. Option A– You can keep with the old fashion collection process. Keep making phone calls, sending faxes of the past due invoice, and emailing polite but firm requests for payment. Option B– File a lien. If you have installed something of value into a home or business, you can file a lien on the homeowners property. If you fixed something, even if it is not a car, you can file a mechanics lien. This is time consuming and you must follow an order of operations by state within a time line. Even then, this action keeps the homeowner from obtaining a loan or selling their house. Option C- Run to a law office for collection. Good luck with that. If you want to recover any resemblance to the original amount due on the original invoice, I would not recommmend this option. Posted in UncategorizedTagged Collections, Liens Being Assets1 Comment on When A/R Is No Longer Considered An Asset & Filing A Lien Is. In most states, the liens laws are hyper-technical. This means that the laws have many requirements, and that courts strictly construe the rules against the party filing construction liens. This is true for nearly every state. While laws across the nation provide lien rights to those in the construction industry, because of the power of these instruments most states require that the liens be filed in exact accordance with the law to be valid. This is especially the case with regard to the required contents of a lien. Each state has different requirements for what must be stated within a mechanic’s lien, and how that information must be stated. Every state, for example, will require the claimant to identify the property being liened. In Louisiana, Washington, and Virginia, however, the law requires that the lien use the legal property description and not simply a municipal address. The proper identification of property can be so important we’ve written an entire blog post about it here. In Virginia, the laws are even stricter. Because the Virginia lien law is land record based, the claimant is expected to perform a complete title search to acquire the exact legal owner and legal property description. A lien that does not lien the exact owner, at the exact property for the exact amount due, can be deemed invalid by courts. Zlien does this leg work for your company, helping your company properly prepare these important legal forms. Our professional legal document preparers are familiar with the lien and notice forms in your state, and can help your company Lien Smarter. Will the 2009 Economy Create More Mechanic Lien Filings? At the Construction Lien Blog, we’ve written about the current state of the economy in America, and how this has affected the construction industry from coast-to-coast. However, there is recent conversation in the media and out in the blog-o-sphere that the economy’s impact on construction has increased the amount of mechanic’s liens filed by contractors. The Pacific Business News source in St. Louis, for example, has a story on a construction attorney in Missouri who says that he filed twice as many liens in 2008 as he did in 2007. A similar article appears in the Virginia Lawyers Weekly, which reports that construction litigation in general is increasing in the current economy, with increased claims for construction delays, defects and problems with collections. It seems that the business journals are full of stories about construction projects being slammed with liens, like the story here and here. As the new year approaches, what will we see in the construction industry that is predicted to remain pretty stagnet? One thing is for sure, regardless of whether lien filings increase, decrease or stay the same, with the current credit crunch and economic woes, it’s more important than ever to file liens on claims you do have, and to do it timely and properly. Posted in UncategorizedTagged All States, Bad Economy, Collection Tips, Credit Crunch, Lien Filing, Why Lien9 Comments on Will the 2009 Economy Create More Mechanic Lien Filings? AllBusiness.com, an online media and e-commerce company that operates one of the premier business sites on the Web, is a great tool for contractors. They self-proclaim to help business professionals save time and money by addressing real-world business questions and presenting practical solutions. As one of its resources, the website has re-published an article written by Lloyd N. Shields, one of New Orleans’ premiere construction attorneys. The article, titled Mechanics Liens and Construction Bonds under Louisiana Law, offers a good discussion of Louisiana’s sometimes peculiar lien laws. When doing work in a particular state – like Louisiana – it never hurts to spend time reviewing the overall lien laws in your area. Understanding and following lien laws is important for your company to avoid bad collection situations, and is increasingly important in this penny-pinching economy. It would be a prudent start to the new year to spend some time getting familiar with the lien laws in Louisiana. You can read some basic information about Louisiana lien laws at the Construction Lien Blog here. The allbusiness.com article is also a good resource. Also, be sure to check out the Construction Industry Center at AllBusiness.Com. I’ve recently set up certain Google Alerts and subscribed to a few RSS feeds that provide updates regarding construction safety standards, issues and problems. Most surprising about the information being distributed is just how often construction accidents happen. Just last week, I was alerted to an incident in Atlanta where a pedestrian bridge under construction had collapsed leaving one dead and 15 others injured. On the morning of that accident, a construction company began what they thought was just another morning. As 2009 approaches, it’s nearly certain that they are restlessly pouring through their insurance policies, speaking to authorities, worrying about OSHA fines and lawsuits, calculating the project’s new delay and having other thoughts that make it increasingly difficult for them to continue work as usual. A construction accident like this is devastating for two reasons: First, people die and get hurt. Second, your construction business has enormous liability exposure and can plummet into a downward spiral of bureaucracy and legal headache. The legal and economical problems associated with a construction accident like this are nearly unmeasurable. A problem like this can happen to your company, and so it’s important to take precautions. A good place to get started? Try the OSHA online assistance center for the Construction Industry. While we haven’t posted on construction safety in the past here at the Construction Law Monitor, we will be keeping an eye on these important issues and making further mention of them. Stay tuned. Gerard Simington with “FindAnAttorneyForMe.com” published an informative article that warns businesses about using free legal forms found on the internet. The Internet has placed legal information and legal forms at our fingertips – and its easy to forget sometimes that the law is a very complicated subject, and legal forms are no exception. While a legal form may seem simple on its face, the blanks can carry significant legal consequences. It’s always great to hire an attorney to draft legal documents from scratch, or to “tweak” legal forms to fit your particular need. The costs associated with legal counsel, however, are simply sometimes out of your business’ reach. Legal Document preparation services like Express Lien are perfect for these situations. Our staffs of professionals are familiar with the forms that relate to your construction project, and we can help you draft & file your forms properly and avoid costly mistakes. The Construction Commando’s “Contractor’s Secret Weapon” published an article with this title that described seven instances when contractors lose money on a project. While the article was drafted to an audience of California contractors, the habits apply nationwide. It will be to any contractors’ benefit to review this article online, access which habits apply to you, and make an effort to avoid the costly mistakes. Any progress will help increase your bottom line. 1) The “Gentlemen’s Agreement” – A Handshake and Your Word. Bottom line: Get it in writing. 2) Using Contracts that Fall Short of the Legal Requirements. 3) Not Getting Every Change Order in Writing. 4) Failing to invoice immediately. Snow Days? Really? Is Your Construction Company Expecting the Unexpected? 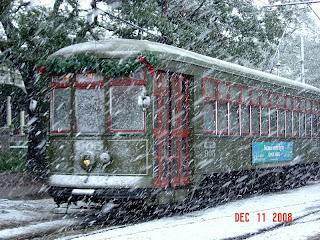 Last week, it was snowing in New Orleans. This week, it’s snowing in Seattle. Two cities very rarely crippled by the white stuff both affected by it in the middle of December, as the Christmas holidays and new year approaches. Our IT systems weathered even Hurricane Gustav, so our firm (with offices in both cities) hasn’t suffered any setbacks from the winter weather. However, we’re not a construction company (See SRTC Transportation Blog for example company affected by Seattle area snow). The recent snow in New Orleans and Seattle acts as a reminder to those in the construction industry that extraordinary weather happens. And according to advocates of climate change, unusual weather is becoming less and less unusual. Last December, in fact, the Construction Business Owner magazine published an article about Climate Change and its effect on the construction industry. While the debate rages…one thing is certain: It’s important that your company be prepared for unexpected weather. Unexpected weather can delay payments. Remember that while unexpected weather can delay the project, payments, and more….it does not delay contractual and statutory deadlines and obligations. If you’re project is delayed because of weather conditions, make sure that you following the letter of your contract to request a Change in the Contract Time immediately. If payment is delayed because of weather, be certain to file your construction lienbefore you run out of time.Handling unexpected weather isn’t necessarily a reactive measure. Contractors can prepare themselves for the unexpected by putting effort in the drafting of Force Majeure clauses in its contract. While frequently overlooked, these clauses can have a powerful impact on construction projects, the handling of weather-related delay and potential exposure on a tardy project. The Mid-West Construction Blog wrote about the significance of these clauses last year. Posted in UncategorizedTagged climate change, Construction Business Owner, Mid-West Construction Blog, weatherLeave a Comment on Snow Days? Really? Is Your Construction Company Expecting the Unexpected?